But what makes Giardino’s Caprese so good is the authentic imported Italian Mozzarella di Buffala. You may have heard of it before, but do you really know why is it called like that? “Buffalo mozzarella (Italian: mozzarella di bufala) is a mozzarella made from the milk of the domestic water buffalo. In Italy, the cheese is produced in almost all nation using Italian buffalo‘s milk and type with official name by Government Mozzarella di Bufala Campana DOP is produced in areas ranging from Rome in Lazio to Paestum near Salerno in Campania, and there are production areas in province of Foggia, Puglia and inVenafro, Molise. Buffalo mozzarella is a €300m ($430m) a year industry in Italy, which produces around 33,000 tonnes of it every year, with 16 percent sold abroad (mostly in the European Union). France and Germany are the main importers, but sales to Japan and Russia are expanding. Apart from Italy, its birthplace, buffalo mozzarella is manufactured in many locations around the world. There are producers in Switzerland, the United States, Australia,Mexico, Brazil, Canada, Japan, Venezuela, Argentina, the United Kingdom, near Macroom in Ireland, Spain, Colombia, Thailand, Israel, Egypt, India and South Africa,all using milk from their own herds of water buffaloes. Some scientists believe that Italy and Bulgaria have the best dairy water buffaloes.“In ancient times, the buffalo was a familiar sight in the countryside, since it was widely used as a draught animal in ploughing compact and watery terrains, both because of its strength and the size of its hooves, which do not sink too deeply into moist soils.”References to cheese products made from water buffalo milk appeared for the first time at the beginning of the twelfth century. Buffalo mozzarella became widespread throughout the south of Italy from the second half of the eighteenth century, before which it had been produced only in small quantities.Production in and around Naples was briefly interrupted during World War II, when retreating German troops slaughtered the area’s water buffalo herds, yet commenced a few years after the armistice was signed. Milk storage (raw buffalo milk stored in big steel containers). Milk heating (thermic treatment to the liquid, then poured into a cream separator). Curdling (by introduction of natural whey). Curd maturation (the curd lies in tubs to reduce the acidifying processes and reach a pH value of about 4.95). Spinning (hot water is poured on the curd to soften it, obtaining pasta filata). Shaping (with special rotating shaper machines). Cooling (by immersion in cold water). Pickling (by immersion in pickling tubs containing the original whey). Packaging (in special films cut as bags or in small basins and plastic). Extracted from Wikipedia, the free encyclopedia. Giardino’s cordially invites you to join us for a casual tasting of fine Italian wines and authentic Italian appetizers! Castello Banfi manager Dan Peabody will be on hand to talk about the wines and the history of Castello Banfi from Montalcino, Tuscany. You will have the opportunity to taste four top wines from Tuscany paired with four classic Trattoria al Giardino dishes. RSVP for this event by calling (214) 618-1991 or email winetasting@giardinoitalian.com. Come join us for our Giardino’s Super Bowl Party in the Bar. Guess the final score and win a Dinner for 2*! Complete the following information to participate. You must subscribe or be susbcribed to our newsletter to participate. 2 salads or 1 appetizer to share, 2 entrees and 2 desserts. Alcohol, Taxes and Tip not included. Reservations required in order to redeem. We recently found out the origin of wine according to legend, which may be as interesting to you as it was to us! According to legend, the discovery of wine is the story of Jamsheed a semi-mythical Persian king, who may have been Noah. A woman of his harem tried to take her life with fermented grapes, which were thought to be poisonous. Wine was discovered when she found herself rejuvenated and lively. We don’t know the details of why she tried to take her own life, but we are all certainly thankful for her discovery! Keep a lookout for future wine facts posted on our blog, and of course learn more about our wines with every visit to the Trattoria! The first Italian-American Thanksgiving I attended, I was absolutely stuffed with rigatoni and antipasti before I even got to the turkey. As is usual for Italian culture, an abundance of food and wine and good company is always in order, whether preparing for a holiday feast or an every day family dinner. For this Thanksgiving, I’m reminded of how much we have to be thankful for at Trattoria. We opened almost 5 months ago, and in that time we have made so many new friends as well as reconnected with old ones. We’ve watched the seasons turn from perfect patio weather to perfect fireplace weather. Through all the good as well as growing times, we’ve been able to bond with each other and our patrons with good food, good wine, and family atmosphere. For this holiday season, whether it is spent away from home or with a large group of loved ones, we are thankful for you and your continued patronage. Please enjoy this holiday and we look forward to hearing about your celebration. Join us in the Italian way of giving thanks daily and living each day to the fullest, for this Thanksgiving as well as everyday. Happy Thanksgiving! Complimentary Pizza: Need we say more? New Featured Wines: We are now offering two new reds and two new white wines for your happy hour enjoyment. Cechi Sangiovese and Citra Cabernet, as well as Rex Goliath Chardonnay and Stemmari Pinot Grigio. Perfect Setting for Happy Hour Groups: We’ve had the pleasure of hosting several happy hour groups, and we hope you will be next! Happy Hour prices and specials are only available in the bar, please see the full menu here. Well there you have it, you now have no excuse to stay away from our Happy Hour and we expect to see you soon! We recently tried a new dining option in Frisco, the Trattoria al Giardino located at Hwy 121 and Legacy in Frisco. We arrived on a Saturday with a 7 pm reservation, and the restaurant was buzzing with folks enjoying the warm ambience of the dining area. At that point, the Trattoria had only been open a week, and like any new restaurant, we expected some hiccups. There were just some minor ones, related to service, but overall, once the kinks and the “opening jitters” are worked out, the service will likely be impeccable. Now to the best part – the food and wine. Our group of four ordered the clams cooked in a white wine sauce, which, in my humble opinion, were the best of the four apps we had. We also tried the carpaccio, which was served with slices of parmesan cheese on a bed of greens. Not the traditional way to serve carpaccio (I’m partial to the capers/aioli sauce version), but it was an interesting take on the dish. We also tried the calamari, fried and tasty, served with the red sauce you’d expect, and embellished with slivers of fried artichoke (a nice touch). We also had the mussels, which were initially brought to our table by mistake (instead of the clams), but the error was immediately corrected, and the attentive manager told us to enjoy the mussels, and then the clams were brought over right away. The mussels were fabulous, served in a small black pot, steaming hot and sitting in a buttery sauce – which then of course was quite suitable for dipping the focaccia bread into. Really good stuff! Each of the entrees were served up promptly, and my “Vitello al Limone” – the veal scaloppini with white wine, capers, and lemon – was tender and delectable. Served with a side of roasted zucchini, potatos and carrots, the veal was light and very flavorful, with the hint of lemony capers adding a zesty flair. My husband ordered the Osso Bucco, which arrived on a bed of lovely risotto. He gave me a bite of both, and both the meat and the risotto were fabulous. I went back for several forkfuls of the risotto. 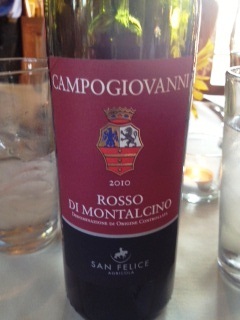 The entire meal was accompanied by a super Italian red wine – a 2010 Rosso di Montalcino. Velvety smooth, yet bold, it was the perfect accompaniment to all of our entrees. Last but not least, the four of us split the Tiramisu. My husband has made this dessert for our family, so I’m slightly partial to his, but Trattoria’s version was quite enjoyable and served artistically with a cocoa powder outline of a spoon and fork decorating the plate. It’s fall, BE OUR GUEST! We spent most of our summer working on a couple big projects this year! First, we completely renovated the interior and exterior spaces at the restaurant. And second, we perfected all the signature dishes that are now found on our lunch and dinner menus. Each signature dish on our menu, was inspired by the freshest and finest ingredients available including; the ripest tomatoes, the best olive oils, and finest Italian flour. The renovations we made to the dining room, kitchen and patio area were all inspired by our namesake. For those who are new, (äl-jar-dē-no) Al Girardino means “in the garden” And, that’s exactly what we provide! The best ingredients available, served in a comfortable and cozy garden-like atmosphere, that captures the heart and soul of what you love most about Italy is what you’ll find here. Veal Limone: Veal scaloppini pan seared with olive oil lemon juice and white wine and cappers. Served with veggie and potato of the day. Veal Siciliana: veal scaloppini pan seared topped with fresh tomato sauce, grilled eggplant and fresh mozzarella, finished with basil. Pollo Parmigiana: Brest of chicken crusted with parmigiana cheese, fried and topped with fresh mozzarella. Served with side of spaghetti with fresh tomato sauce. Risotto Pescatora: Arborio rice sautéed with combination of mussels,clams,calamri, and shrimp with homemade fish stock and light tomato sauce. Rigatoni Bolognese: Rigatoni with classic Italian meat sauce. Papparddelle al Pomodoro: Wide flat pasta with fresh tomato sauce,garlic and basil. Gnocchi Gorgonzola: Homemade potato dumplings in a cream sauce with melted gorgonzola and parmigiana.